My two-leggers are so afraid of my fearless abandon when it comes to ridding the estate of undesirable intruders that they have placed me under house & bookshop arrest. I’m only allowed out on a leash and just before and after rides. “Oh. Well, yes. But I was young and foolish then. And, as I recall, it was you who went through the hard water last winter. Not me.” She did, too. It was the strangest thing when it happened. She had run across our bay to get a picture, then she thought she’d go for a longer walk with me. As she went around the end of our point, there was a sort of popping noise and Elizabeth fell flat on her face. I came over to see what she’d cried out for, and the hard water began to make a funny cracking noise. Elizabeth yelled at me to get back, and she managed to get her leg out of the splashy stuff and the hole in the hard water. Then she rolled really fast until she was on the trail the noisy machines that travel on the ice make. I had a good sniff at the hole she made. It wasn’t very big, but it was fascinating. Who knew the water wasn’t hard all the way down? I was able to have a nice drink of cold splashy water. It was refreshing! 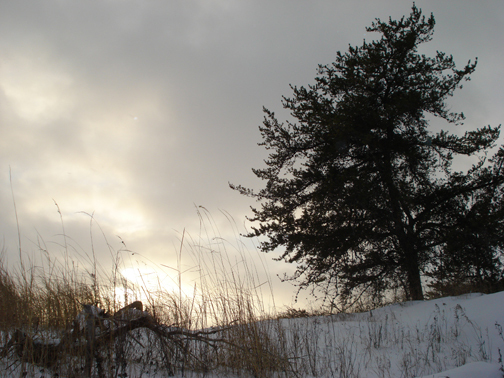 We’d had snow flurries all day and the sun was just breaking through the clouds late in the afternoon. Elizabeth took this picture just before she fell through the ice. Elizabeth looked a bit worried as she looked over our bay toward the house. It wasn’t very far away, but she’d got her whole left leg soaked and had to walk home through unpacked snow and up a steep hill in -27 C and wind. Two-leggers are different from us dogs. They aren’t as hardy. She was swinging her leg in a funny way by the time we got to the door – all the human fur she’d put on it to go outside in the first place was frozen solid! I tried to help her by biting the ice out as we walked home, but that just got her angry at me. She wanted to get home in a hurry, I guess, and I was slowing her down. Well, I got another couple of stories about a dog she had a long time ago and one about Cocoa the Cheasapeake Bay Retriever. Both Pup and Cocoa went through the ice and couldn’t get out without two-legger help. Elizabeth was able to help them, but she’s afraid she might not be able to help me if I got out too far, or if she didn’t hear me or realise I’d gone through. Pup and Cocoa were both Chessies and made for cold water, and they went through in the Spring and close enough to shore that Elizabeth could reach them with poles or by smashing through the almost candled ice to make a path for them to swim out. Fall ice, she says, is different. And I’m not as strong a swimmer as the Chessies were. I’m only 1/4 Newfoundland. That’s the swimming part of me. And I don’t have the protective oily coat that sheds water – my wool gets soaked pretty quickly when I swim. So, for now, I’m an indoors dog. I can still sleep under the stars if I want, and I’ve pulled my blanket out of my house a bit for just that purpose. As long as my wool is dry, I’m warm enough! But the only running and chasing I’ll be doing for the next couple of weeks will be in my dreams.